The pictures were taken on June 20, 2009. 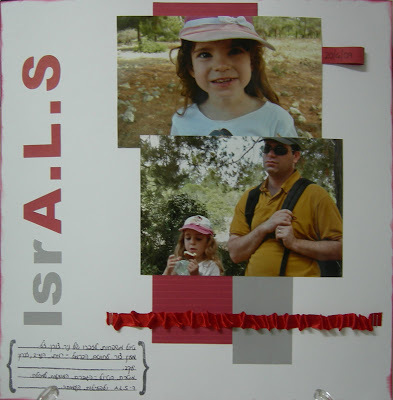 This trip was in memory of Nir Zoran, who died because of the ALS disease. The purpose of the trip was to increase the awareness to the disease, as well as IsrA.L.S (non-profit organization) activity. 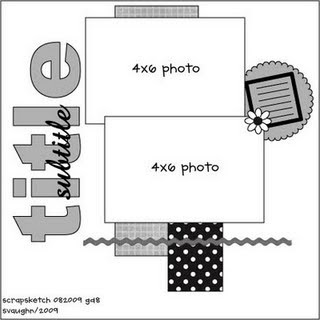 I used: Miss Elizabeth's Bright White cardstock, sonburn cardstock, Scrappy Cat Journaling Blocks clear stamp, Sharpie. 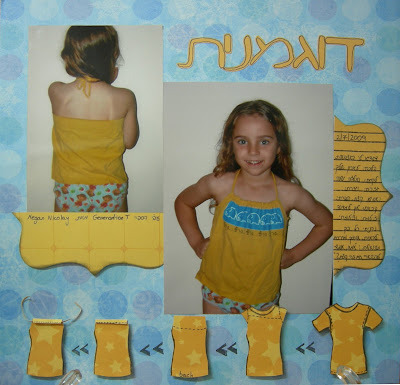 Here's my layout, Yaara is modeling a shirt I made for her. The instructions for this T-shirt was taken from Generation T by Megan Nicolay, and she demonstrates this shirt on youtube. The journaling says: My fingers were tickeling, I went to your closet, took an old T-shirt, cut & cut and even sew a little. I called you to try it on, I took pictures and more pictures. I enjoyed so much to see you're smiling and asking: "Mommy, can I stay with it for a little while?" I used: Miss Elizabeth's Snowflakes papers, sonburn cardstocks, Scrappy Cat Journaling blocks clear stamp, Studio G clear stamp, Sharpie ,StazOn jet black, Quickutz Silhouette to cut the title.